A mere 45 minutes by train from the buzzing city of Barcelona, lies one of the most exciting day trips. Penedes is the area of Spain where nearly all Cava production takes place. It’s a region with lovely towns, beautiful landscapes, and a first-rate experience all around. On this recent trip to Spain, I set out to become a Cava expert. :) I made sure to drink as much of it as possible, and can easily report back that this stuff is worth seeking out. Thankfully, when you’re in Spain that won’t be difficult. Cava is Spain’s answer to champagne. The production process is similar and a discerning palate can spot the differences, but what might have been thought of as the poor mans champagne, has definitely grown in popularity. 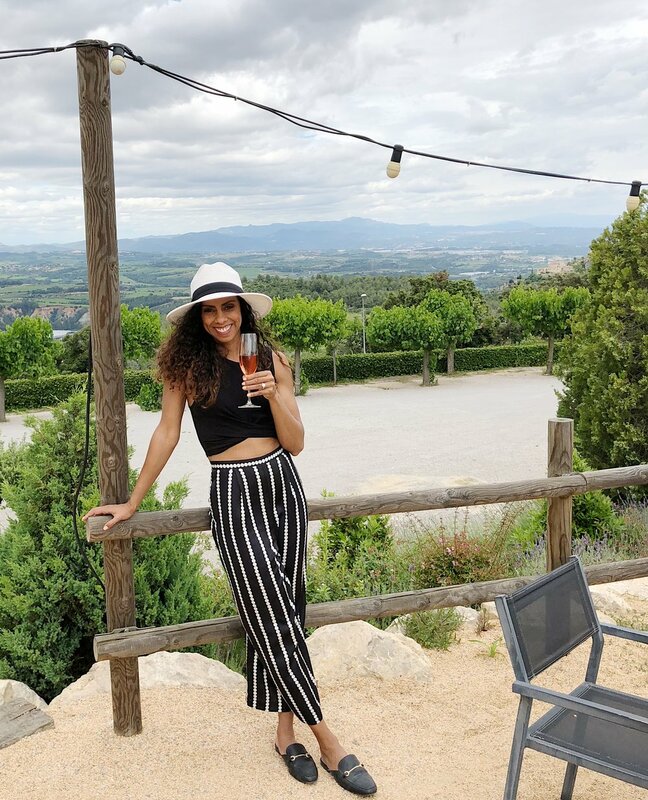 If Barcelona is part of your Spain itinerary, check out my tips on how to have an amazing day trip to the Cava capital of the world. It’s easy to get set up with a driver for your cava experience, and have the whole day custom designed for you. This way your day doesn’t need to be planned around a tour timetable, or a train schedule. There are some tours that start in Barcelona and you will begin your experience from a central meeting point. Others will be joined once you are in the area, and you’ll travel by train to reach Sant Sadurni d’Anoia (the easiest part of the Penendes region to get to by train). If you decide to travel independently, you’ll travel by renfe R4 train from Barcelona Sants to Sant Sadurni d'Anoia station (8.20 euros return). Note that my hotel was located near the Arc de Triomph station and I could hop on there and travel straight through on the R4. Once you arrive, if your first stop is right in town, it’s an easy walk. If it’s slightly further away, you can get a local taxi (12 euros each way). If there is no taxi at the Sant Sadurni train station, the taxi phone numbers are listed on the pole at the 'taxi' stand and take about 10 minutes to arrive. If you want to Go Big: Freixenet and Codorníu are the biggest wineries in the area, and are probably more widely recognized than some of the smaller cellars. Both have good English tours, but you aren’t going to get the personalized experience you have at a smaller producer. Freixenet is definitely the easiest to reach; it’s right next to the train station. Codorníu is a gorgeous property. A visit to here gives you not only a vineyard steeped in history, but beautiful architecture to go along with it. Just note that it’s not within walking distance, so you’ll have to spring for a cab ride. If you want to Go Small: This was the choice I opted for and the two vineyards I visited. Gramona is a historic cellar that is definitely worth visiting, and is located right in town, so you can easily reach it by foot from the train station. A visit here really gives insight into how the traditional and manual cava process takes place. It’s fascinating to see all that they do to produce a delicious bottle of cava by hand! Cava Llopart was my favorite, as its located up in the hills of Sant Sadurni (taxi necessary), and the view alone is worth a trip. They are one of the very first cava producers, and the tour we had — while not booked as a private tour, ended up being private. This is another advantage to visiting the smaller producers. I’m a big fan of smaller, boutique wineries that allow for a more intimate experience. However, you may be the opposite and that’s fine too. I decided to do my visit here independently to create the type of experience I really wanted to have, and visit the vineyards that were most interesting to me. The train schedule worked easily for us, but I would also do this with a driver as well to make sure we could easily get around, and perhaps even visit some of the other towns in the area. What you need to know is that it’s necessary to have an appointment anywhere you’d like to visit. Some of the bigger places allow you to do this online, and most of the smaller ones you are going to have to email or call if you are going at this independently. Here is my personal opinion after my day of immersion in the land of bubbles — Dollar for dollar, Cava blows Champagne out of the water. Prosecco isn’t even in the conversation. I realize that you can pay a pretty penny for a fabulous bottle of Champagne, and I’ve done it before. But that’s kind of the point — it is hard to buy an expensive bottle of Cava because it’s intentionally affordable. More than that though, come here to meet the incredible people behind these tasty bottles, enjoy some gorgeous scenery, and escape the noise of the city for a minute. You’ll be glad you did.